Thursday morning I was on the Benzinga morning radio show chatting with the guys about the S&P500 as well as some individual stocks and commodities. I really enjoy doing this show because they like to focus on the market and price behavior, as do I. We don’t have time to be telling stories, so we focus on price, which is the only thing that pays us. If you enjoyed this PreMarket commentary, Click Here find out how you can receive weekly newsletters from JC and Eagle Bay Solutions. Shares of Tesla are down Monday morning after breaking down from what normally is a bullish continuation pattern. 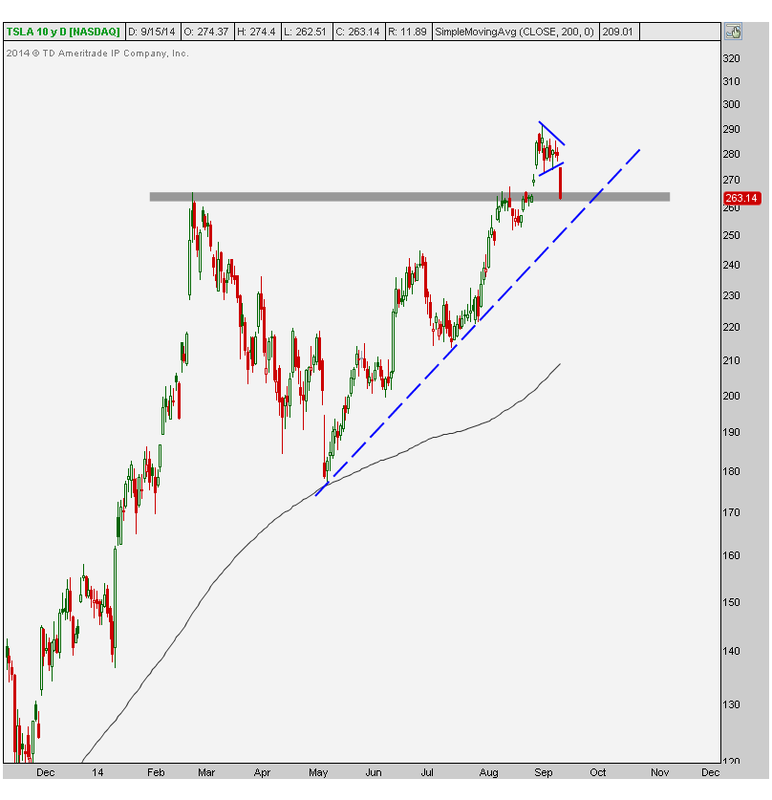 This tight consolidation throughout the first half of September is what most technicians would consider a bullish pennant that traditionally resolves itself in the direction of the underlying trend. But in this case, the pattern broke down rather than up. So far this appears to be the case as shares of TSLA stopped dropping once they hit this 264-265 level. But a break below that could be disastrous for this popular momentum name. I would also use this uptrend line from the May lows as a key level for risk management. Bulls are fine as long as that 264 holds, otherwise a test of this uptrend line is in the cards. If neither one of those can serve as support, then a test of the 200 day moving average is likely, which is near the 210 level. Something else worth mentioning is that a breakdown below this former resistance near 264 would confirm that this breakout earlier this month was a failed move, and would suggest a fast move to the downside is coming. So although we do have that uptrend line in the 250s, the former resistance shaded in gray is really my key level. 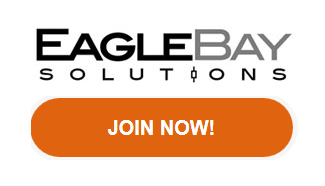 REGISTER HERE to become a member of Eagle Bay Solutions and receive weekly updates on your favorite stocks, commodities, currencies, US Sector and Global ETFs. I had a nice little chat with the Benzinga guys this morning. We talked about Emerging Markets, Treasury Bonds, Euro, Canadian Dollars, Blackberry, Tesla, Apple, Regional Banks, Gold and Silver. We went over some pretty important topics today. One of the things that I try to emphasize the most is that when it comes to this market, it’s not about being right, it’s about making money. I can’t tell you how many times I’ve been bullish and faded strength and how many times I’ve bought dips when I’m bearish. It’s all about knowing your timeframes, risk parameters, and being disciplined. There was interesting strength in US Stocks and US Dollars on good economic data Friday, while European Stocks and the Euro sold off Thursday on the rate cut. Looks to me like the market is telling us they are more concerned with a good economy than easy money. Maybe I’m wrong, but that’s how I saw the market behave this week, so we’ll see. Bonds were really disappointing Friday. I think the dynamics of this trade have now changed in the short-term and I don’t see any reason to be bullish for now unless price proves otherwise. Corn is probably the most interesting thing out there right now, as far as I’m concerned. We go over this trade in detail and also discuss market psychology as usual.